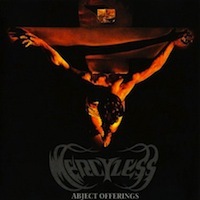 The debut album from France’s MERCYLESS originally came out on Restless Records in 1992, and 22 years later “Abject Offerings” sees a re-issue at a time when old school Thrash/Death is gaining prominence again. Although there aren’t any really bonus cuts on here, this 8-track release has a lot of that early 90’s intricacy that was prominent from veteran bands that sought to stretch their musical wings while still being brutal and heavy. Songs such as “A Message for All Those Who Died” and “Unformed Tumors” featured a lot of lightning fast riff changes, technical transitions, and tempos that would go from furious abandon one moment and then slow, creepy tribal-like beats. Max has a raspy, low growl that wouldn’t be dissimilar to Chuck from DEATH – while musically a lot of MERCYLESS’ sound has qualities of MORBID ANGEL, PESTILENCE, and maybe early MORGOTH. The band certainly had skill sets that rivaled their contemporaries, but didn’t necessarily have enough originality to really separate them from the pack. Certain segments stick out above others (the slow to speedy juggling riffs during “Substance of Purity”, the melodic lead break elements within “Burned at the Stake”) and yet there isn’t one song that maintains that level of clarity necessary to make “Abject Offerings” a must have effort in 2014 in comparison to the deluge of releases for this genre in 1992. I suppose the younger generation who wants to seek out more of the worldwide Death/Thrash offerings may want this, but in the end MERCYLESS did not eclipse the brilliance of DISINCARNATE or make the move that MORGOTH would through “Odium” to ascend up the underground ladder of acceptable and larger appeal. With the band back on the studio/live front again, MERCYLESS are hard at work on another studio album- so time will tell if they can still deliver new material that rivals their catalog.